China's progress in reform and opening up not only changes itself, but also influences ASEAN economies and the world at large in a profound way – this was one of the conclusions of a high-level forum entitled "40th Anniversary of China's Reform and Opening-up: Progress, Prospects and Impacts on the East Asian Region" held in Beijing on Oct. 26. The forum attracted a good mix of high-level policy-makers from the ASEAN+3 Region, as well as renowned academics and senior representatives from international organizations and the private sector to attend and offer their opinions. 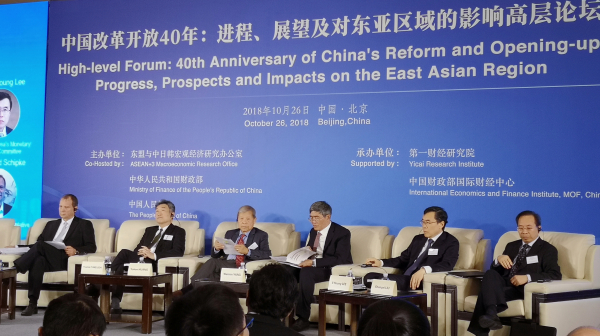 According to Chang Junhong, director of the ASEAN+3 Macroeconomic Research Office (AMRO), one of the organizers of the forum, many participants had first-hand experience in the reform and opening up process in China as well as the development of China-ASEAN's integration. Co-organized by AMRO, China's Ministry of Finance and the People's Bank of China (PBOC), the forum used AMRO's recently published report entitled "China's Reform and Opening-Up: Experiences, Prospects and Implications for ASEAN" as a background document for discussions. The study analyzes how, over the 40-year period from 1978, China had transformed itself from a low-income to an upper-middle income country with average annual GDP growth of 9.4 percent. Finance Minister Liu Kun introduced China's achievements during these four decades briefly in his keynote speech at the forum, quoting various data. He highlighted how China had lifted over 700 million people out of poverty, and contributed over 30 percent to world economic growth for many years in succession. China has been upholding market-oriented reform and an open economy, Liu said, adding that it had lowered its general level of tariffs to 7.5 percent, and would continue to open up its financial service industry. Yukon Huang, senior fellow of the Asia Program of the Carnegie Endowment for International Peace who has been working in China since 1997, said: "China's experience of reform and opening up is very impressive". He attributed the success to a pragmatic and experimental approach to reform, balance between decentralized initiatives and central governance, efforts to promote a greater role for market forces with state-set priorities, and reforms evolving in line with changing circumstances. Alfred Schipke, International Monetary Fund's senior resident representative in China, also hailed the 40 years of China's reform and opening up as a miracle. "China's economic development has been mirrored by the rapid development of its financial sector," Schipke said. Summarizing China's efforts in finance and banking in the past decades, Chen Yulu, deputy governor of the People's Bank of China, highlighted how it had been working to enhance financial efficiency, stability, inclusiveness and openness. It has continued to push forward reforms in various financial institutions, and improving regulation in line with trends in the financing industry, Chen said. He also added that China has also been developing inclusive finance to benefit SMEs and private companies, while promoting financial opening and cooperation worldwide. According to the AMRO report, ASEAN has benefited greatly from China's opening up to trade and investment. Data shows that China trade and investment in the region as well as Chinese tourist flow had all increased rapidly over the years. The U.S. and Europe were Thailand's largest trading partners, but now China is the No. 1 trading partner, said Bandid Nijathaworn, former deputy governor of the Bank of Thailand. In addition, among the tourists from across the world traveling to Thailand, China also leads the way. Nijathaworn also highlighted that China's participation in the regional organizations had helped increase their influence in the world, greatly benefiting the region. The AMRO report also shows how the economies of China and ASEAN members have become more integrated, with both sides benefiting substantially in the areas of trade, investment and tourism. Looking ahead, practically all the panelists in the session discussing the implications of China's reform and opening up to ASEAN were optimistic about further integration. Thipphakone Chanthavongsa, vice minister of Finance of Laos, was one of these, believing that all countries in the region gained benefits from it. Meanwhile, Zou Jiayi, China's vice minister of finance, said the country's further economic growth and further opening-up would surely contribute more to regional economic development,. Zou also put forward her proposals for further "10+3" integration including coordinating international organizations in the region so as to formulate a framework for regional economic governance, strengthening prevention and control of financial risks and maintain financial stability, as well as diversifying financing channels for infrastructure construction. China's progress in reform and opening up not only changes itself, but also influences the world in a profound way, according to a high-level forum held in Beijing on Oct. 26.